The world premiere of a new play by Lindsey Ferrentino, directed by Tony Award winner Rebecca Taichman, that takes a look at the after-effects on members of a community where a number of school children died in a shooting. Julie (a dynamic Ella Kennedy Davis) and her pal, Zander (Ian Saint-Germain) feel awkward around each other, but it's not just because they are exploring whether they have romantic feelings for each other. The last time Zander put his arms around Julie, it was to help protect her from the shootings in their school while the two hid in a closet. They survived, but nine of their classmates didn't, including Noel, whose mom, Lisa (Cassie Beck) makes them VERY uncomfortable. Everyone is trying to go as if the tragedy never happened. Julie is blindsided by the realization that it has happened before at other schools and probably will happen again. The situation is made even more tenuous when Lisa clashes with Julie's dad, Dan (Lucas Papaelias). Julie turns to her mysterious upstairs neighbor, Cloris (Lynda Gravátt) for counsel. Can't any of the grownups do anything right? Can't they fix anything? Davis gives a powerhouse performance. She's a little kid forced to grow up. We understand why she jumps at every sound and is afraid to leave the house. Characters are underdeveloped. They and the story seem to exist only to forward an anti-gun agenda. Julie's constant screams of "Are you there?" become tiresome. The play reiterates current cultural unrest about gun violence in schools, and stirs angst, but doesn't go much beyond that if you are looking for answers. The production also features Grammy-nominated cellist Christine Kim who is seated in the house. 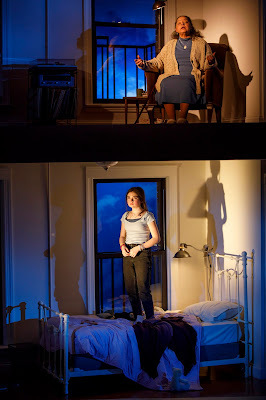 Scenic Design by Dane Laffrey, Costume Design by Paloma Young, Lighting Design by Christopher Akerlind, Sound Design by Mikhail Fiksel.